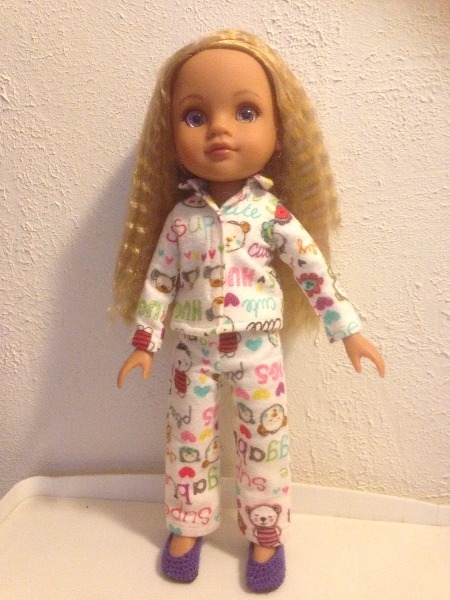 Make some cute pajamas to keep your doll warm and cozy. Use flannel or other woven fabric to make them. A version for a short sleeve with shorts option is included as well. This is a wonderful pattern for girl and boy dolls! This PDF pattern is designed to fit 13 to 14 inch dolls such as Corolle Les Cheries, Hearts for Hearts Girls, Paola Reina Las Amigas, Melissa and Doug Mine to Love and 14 inch Disney Toddler Dolls. This cozy pj pattern is also available for 18 inch dolls such as American Girl, Disney Animators' dolls and Welliewishers. PixieFaire and the designers featured are not affiliated with Disney®, Heart for Hearts®, or Corolle®. The pattern was very easy to follow and the pajamas turned out great! The pattern worked up really good. The fit was perfect for my Les Cherie doll. Great pattern for the smaller dolls. Fits the Les Cheries and Hears 4 Hearts beautifully. A versatile pattern to have in my stash. I'm sure I will use it over and over.